The Olive Branch is owned and run by Olive Finn and Andy Beattie. They opened their establishment in 2004 in Spiller’s Lane, a beautiful, quirky pedestrian lane in the heart of Clonakilty Town. A lot of change has taken place in the 12 years since opening, but both their commitment and love of what they do remains the same. 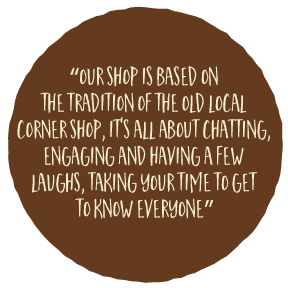 This health food shop offers far more than just health food, the shop is a centre and support system for people from all walks of life….”We support and encourage people to take their health in to their own hands and do the best for themselves”.